Newborn sessions are my favorite. I get to document the story of a family growing. While the focus is on your newborn - their little features, their smirk or them dozing off into a milk coma, I also love to capture all the other details of welcoming a new baby into your lives. The little details in the nursery that you've worked on for 9 months, the way mama has an instant glow when she looks at her baby born not even 48 hours old, the way daddy cradles her so sweetly and would do anything to protect her, how big brother or sister obsess over "their new baby" - I love to document it all. My passion is to capture those honest, sweet, sometimes emotional moments that come with welcoming in a newborn. Lifestyle Newborn Sessions are captured within your home during the first two weeks of baby’s life. 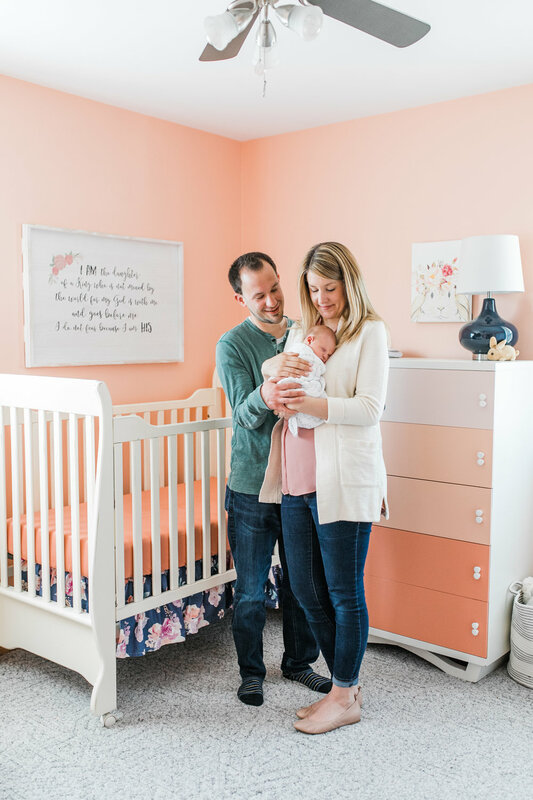 I love to capture those favorite spots within your home like the nursery you’ve spent 9 months designing or cuddled up on the couch snuggling as a family. Moments like mama rocking her baby, daddy kissing those sweet little cheeks are my favorite to remember. Hospital Newborn Sessions are when I come to the hospital within the first 48 hours after your baby is born to photograph your family and baby. I love to capture the newness of you little one - the wrinkly skin, the hospital bracelets, the little hats; big brothers and sisters loving on their new baby, and to help you remember those first moments, since they go by so fast! Studio Newborn Sessions take place in my white, natural-light studio space. The focus of these sessions is to capture the sweet, natural moment between you, your baby, and family. I use minimal props such as an all white bed, natural moses basket and swaddles. These sessions work great if you are worried about the lack of natural light in your home. Inquire about your due date month to see my availability. I have a limited number of newborn session available per month. Pay $50 deposit to hold your due date month. This $50 counts towards your entire session fee. Fill out the questionnaire which tells me about your family, home, and anything special to include in your session. Lifestyle & Studio Newborn sessions take place within the first two weeks of birth. Hospital sessions take place before you leave the hospital, usually the day after you give birth. Once you are on my calendar, after your baby is born, contact me to let me know so we can set-up a time that works best for both of us. Lifestyle newborn sessions take place at your home - we'll focus on rooms such as the nursery, the master bedroom, or the living room. I like to document rooms that may have a special meaning for you, or where you spend a lot of your time. I want you to be able to look back at these photos and remember the chair you always nursed your sweet baby in or the couch where daddy would nap with baby on his chest. When I arrive at your home I'll take a look around and see what areas might always work well due to the natural light available. I'll also ask you to fill out a questionnaire that asks you how the natural light is in these certain rooms and at what time of day they are the most bright - that helps me determine what time of the day we should schedule the session. Homes and rooms that have a lot of natural light photograph best for lifestyle newborn sessions. If you don't feel comfortable photographing in your home due to the lack of light or decor, then a studio newborn session or a hospital newborn session are great alternatives. Studio Newborn sessions take place at my natural light studio located in Waukesha. The studio features an all white set-up, with a few props such as a moses basket. Hospital sessions take place where you plan to give birth. Light neutrals (whites, creams, tan, light gray) always photograph well with my bright and airy style of photography and are timeless. Please stay away from loud, busy patterns, logos, and dark colors. In the photos, I love for the focus to be on you and your family versus what you wore. For baby, start with a simple onesie and swaddle. I have a few swaddles I bring to the sessions as well if you’d like to use one of those. For lifestyle newborn sessions, I like to remind my clients to look at the colors of your home and the rooms we will be photographing in - it works well if your clothing colors and patterns complement each other. If you want to talk over outfit choices, don't hesitate to email me and ask! I've also made this pinterest board for you to refer to with examples. You can also scroll down below to find more images of previous newborn sessions with lots of ideas on what to wear. Since my newborn sessions are all about telling an honest story of your growing family, I like to keep props to a minimum - all we need is your family and the baby to tell that story. If you have special heirlooms or other things to include in the session, we will definitely work them into the photographs in natural settings. I will bring a few swaddle blankets with me and we can use those if you'd like. If you have questions about including certain items in your photo session, don't hesitate to contact me! Babies like to be warm, please turn the heat up if necessary! If possible remove clutter that might be distracting in the background of photos (clutter on nightstands, dressers, counters, etc). If your crib has bumpers, I prefer you remove them for the session if possible. I love to get some shots peeking into the crib. Think of something "routine" you do with your baby that we could also photograph during my time there. Maybe it's just a simple diaper change, feeding, giving baby a bath, but something that would be fun to document, because even the most ordinary things are something you won't want to forget. Once your session is over you'll receive your digital gallery within 2-3 weeks. You'll receive your digital images in both color and black and white. You'll be able to download them all, along with a PDF for the printing rights. You'll also be able to share with family and friend easily. You will have the option to order prints and products through the online gallery which is the only way I can guarantee 100% color accuracy. I always love to post a sneak peek on social media (Facebook and instagram) within 1-2 days. So watch for that! Thank you for allowing me to capture this special time in your families lives, it means SO much!